All hail the mighty Bone Shaker! 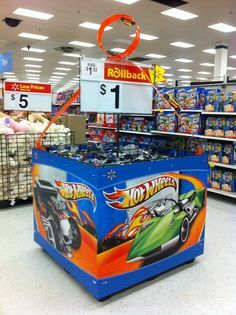 The casting has served as the signature vehicle of the Hot Wheels brand since 2006. Right away, collectors were drawn to this heavily modified, rat-rod-style, original design based off of a Model A. 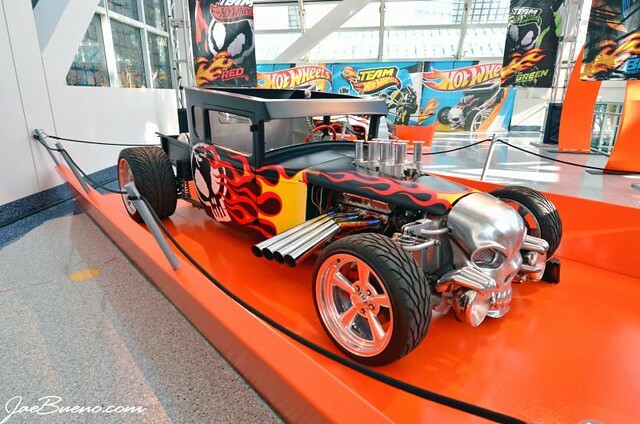 Legendary Hot Wheels Designer, Larry Wood spared no detail when designing the Bone Shaker. When the Bone Shaker was revealed, collectors first noticed the skull on its front end which made the casting come alive with character. But it didn’t stop there. The simplistic black paint job with a basic skull & crossbones on the doors said it wasn’t about flash, it was more about personality, a personality that is a skull-faced racer that is ready to smoke you from start to finish. Often times, mainline vehicles lack a certain detail or character due to costs. Through the years, Larry has always managed to cultivate beautiful castings with character. Only further proving that he is deserving of his title, “Mr. Hot Wheels” among collectors and some internal people at Mattel. As unique as the Bone Shaker is, the name “Bone Shaker” did not originate with this casting. In 1971, Hot Wheels introduced a series of motorcycles named Rrrumblers. 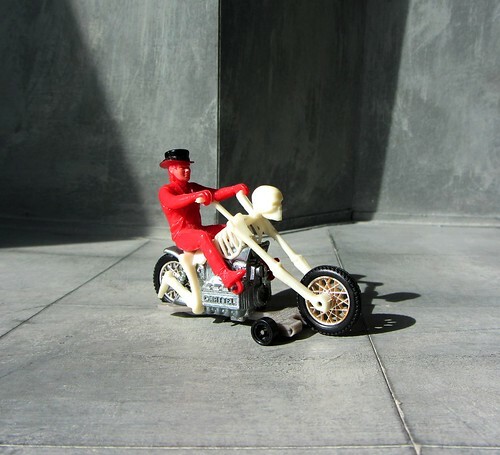 In 1973, the Bone Shaker was released–a man in a top hat riding on the back of a skeleton motorcycle. In mint condition, this Bone Shaker motorcycle goes for hundreds of dollars. The re-incarnation of the Bone Shaker came in 2006 with the release you see below. 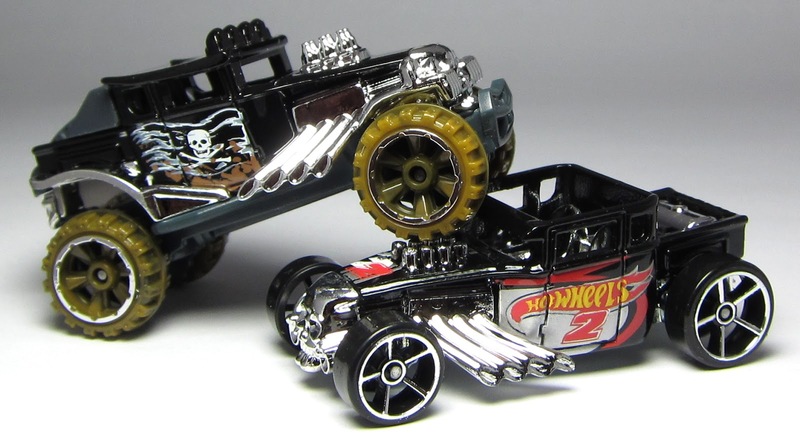 Since 2006, the Bone Shaker name and likeness has been plastered over all things branded by Hot Wheels–from school supplies to video games; from Megabloks to birthday party supplies. It didn’t stop there. The Bone Shaker has a hard-top-roof version to go along with the original open-top version and even crossed into the off-road category with the Baja Bone Shaker. AND it didn’t stop there! 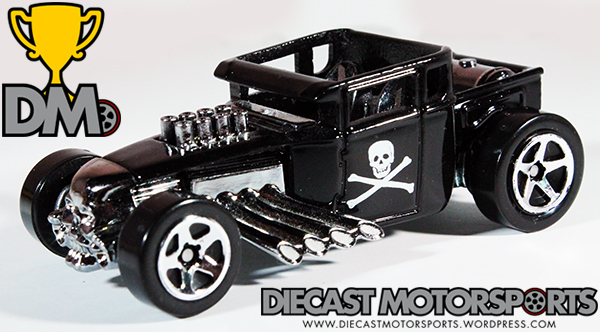 The Bone Shaker was even manufactured in 1:87, 1:43 and 1:1 scale–yes, there is a real-life, full scale Bone Shaker! So while the Bone Shaker continues to be a hit with collectors and kids alike, don’t expect to releases of the Bone Shaker to slow down. If you’re up for a challenge, try and track down all of the Bone Shakers out there. There are more than 74 versions of the casting just at the 1:64 scale. RELEASE DETAILS: Gloss Black Enamel Body (metal). Dark-Chrome Interior. Chrome 5-Spoke (5SP) Wheels. Unpainted Metal Base. Made in Malaysia. Toy# J3247. Released in 2006 as #6 of 38 in the 2006 First Editions. I have all the releases..working on a few last variations….plus there was also a 1/92 scale released as well.